AGROVOC team takes this opportunity to inform all interested parties about the new AGROVOC release - November 2017. As you may already know, beginning in April 2017 AGROVOC updates its content on a monthly basis ! The AGROVOC Team would like to thank and express its gratitude to all AGROVOC editors who contributed to this new release ! Our special thanks goes also to our AGROVOC Editor in Ukraine - Tatiana Deribon, who was interviewed by the AIMS Team about her "long way towards and with AGRIS and AGROVOC". As of today, AGROVOC counts 34,599 concepts (compared to : 33,059 concepts in July 2017) and 660,348 terms (compared to : 652,007 terms in July 2017) in 35 languages ! Aquatic Sciences and Fisheries Abstracts (ASFA): Thesaurus (triples 1784); BioTechglossary (triples 793); DBPEDIA (triples 11015), Dewey Decimal Classification (DDC) (triples 398), DNB (triples 6212), EUROVOC (triples : 1269), GEMET (triples 1185), GeoNames (triples 206), GeopoliticalOntology (triples 253), LCSH (triples 1079), NALT (triples 13644), RAMEAU (triples 671), STW Thesaurus for Economics (triples 1125), Thesaurus for the Social Sciences (TheSoz) (triples 827), Environmental Applications Reference Thesaurus (EARTh) (triples 1385), Chinese Agricultural Thesaurus (CAT) (triples 20702), Il Nuovo soggettario of National Central Library of Florence (BNCF) (triples 1967), CAB Thesaurus (triples 38). 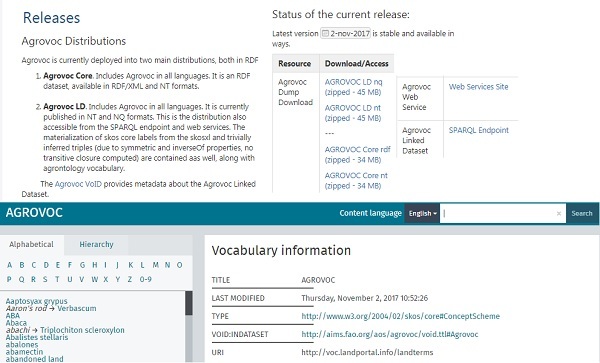 You can discover more about AGROVOC concepts, terms and relationships - by starting with searching and browsing for AGROVOC items in SKOSMOS. Do you want to be constantly updated on the ongoings (and also to share specific news) on AGROVOC issues? You are invited to Join AGROVOC DGroups mailing list.